Over the past couple of months Corsair and G.Skill have introduced multiple 32 GB enthusiast-grade SO-DIMM memory kits for ASRock’s X299E-ITX/ac motherboard, gradually increasing the data transfer rates from industry-standard DDR4-2400/2667 to 3800 MT/s and then to 4000 MT/s. Apparently it’s time to speed up 64 GB kits too in order to address small form-factor systems that need a lot of fast DDR4 memory. 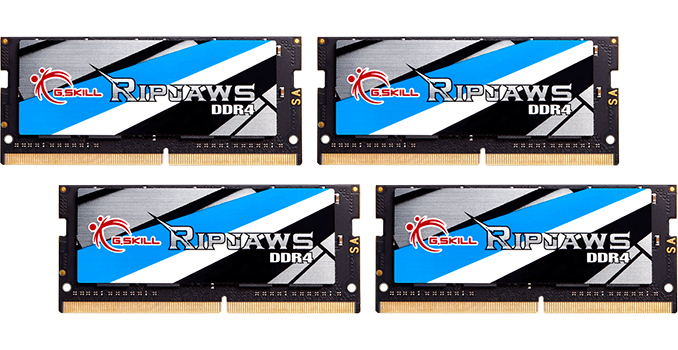 G.Skill’s latest quad-channel Ripjaws DDR4 SO-DIMM kit consists of four 16 GB memory modules rated for DDR4-3466 mode with CL17 17-17-37 timings at 1.35 V. These SO-DIMMs are based on pre-binned Samsung’s 8 Gb B-die chips that power other enthusiast-class modules, and come with XMP 2.0 profiles tailored for Skylake-X processors. G.Skill validates the quad-channel kit for operation only on ASRock’s unique Intel X299-based Mini-ITX motherboard - other devices are variable. Performance difference between G.Skill’s latest Ripjaws 64 GB DDR4-3466 kit and the Ripjaws 64 GB DDR4-3200 kit formally introduced a couple of months ago is merely 8% as far as memory bandwidth is concerned. The trade off in data rate is one of latencies, so the real-world performance benefit of the new set will not be as high as the theoretical one, unless someone is dealing with an application that relies solely on memory bandwidth and around 8 GB/s of peak bandwidth makes a difference. 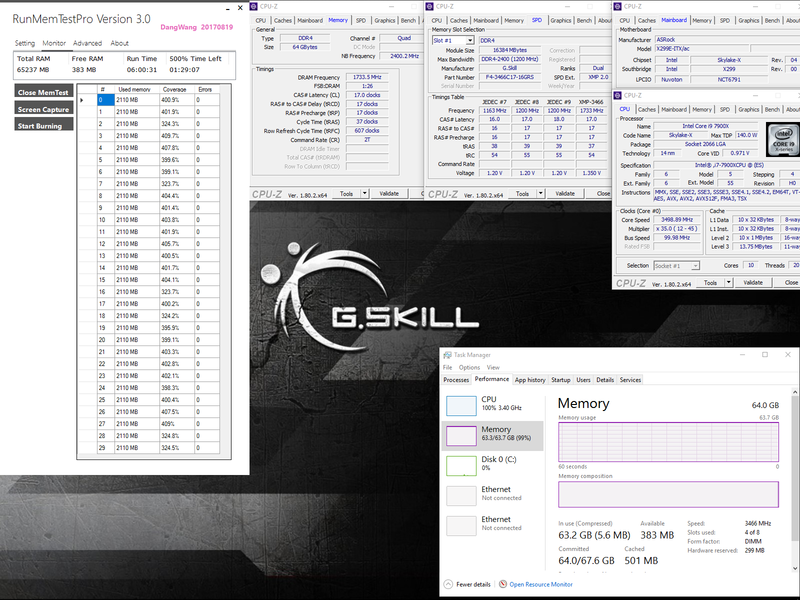 Meanwhile, it is noteworthy that G.Skill’s fastest full-size 64 GB quad-channel kits for “large” HEDT motherboards listed on its web-site are rated to run at DDR-3333 CL16, so formally the new kits for "baby" HEDT systems are faster. G.Skill traditionally does not talk about pricing of its products in press releases and the only thing we know about the new Ripjaws kit is that it is going to be available in Q1 2018. Since 64 GB is an overkill for gamers and many prosumers, we can only guess about pricing of the kit. At present, you can buy the company’s Ripjaws DDR4-2666 64 GB (4 x 16 GB) SO-DIMM costs around $930 at Amazon and $813 at Newegg, so it is obvious that a faster kit will cost more. Time for exactly one build then.